A bit of a personal reflection post today, but this is also a topic I see that comes and goes in ‘waves’ amongst my peers and a lot of in the ‘vCommunity’. Imposter Syndrome is something that affects a lot of us, and it isn’t always easy to work through it. Timing on this is also impeccable, given that I just wrapped up my first Tech Field Day event. I’m not ready to start re-capping the event yet, but in the spirit of the vDM 30 in 30, I wanted to get something posted today. 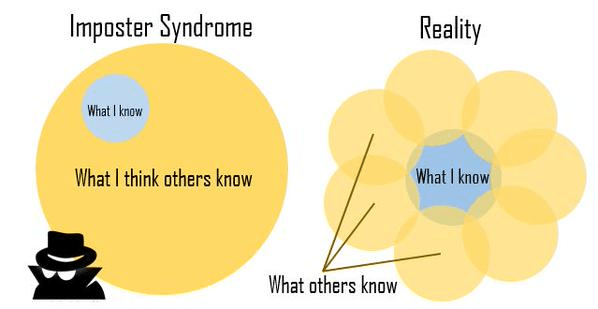 For those who don’t know, Imposter Syndrome is basically feeling that you don’t belong, or that you are a fake. A lot of folks seem to experience this, sometimes it’s before a presentation, sometimes it might come after talking with peers. I for one have definitely fought with it, and it can be very demoralizing if you let it get to you. I have had an unbelievable string of luck and opportunities this year. Looking back at all that I have done and accomplished, I am truly grateful, and I can’t believe it all has happened in this calendar year. Things like being asked to co-present with Rick Vanover at the Toronto VMUG, and then being followed up with becoming a Veeam Vanguard. It was truly humbling to be involved with both of those events, and for both of them, I thought ‘why me? I’m nobody special’. Instead of saying ‘no’ to co-presenting, I jumped at the opportunity. I had no idea what the presentation would be until the night before. ‘Old Me’ would have freaked out, but I decided in my head that if Rick asked me to co-present, then he must have faith in me. The list goes on with personal accomplishments that I am proud of (don’ t worry, I’m not going to list them out and brag), but that feeling of ‘do I really belong here’ still comes back with each new opportunity. I’ve come to realize, and more importantly accept something: nobody knows everything, and chances are I know something that others don’t know. What I mean by that last statement is I don’t expect to drop some sort of knowledge bomb and stun a crowd. Rather, when presenting, or being included in a group (e.g. the Vanguards or Tech Field Day), I am sure that I can bring something to the table. I may not know what that is, and I may never even realize that I’ve added value. So how do I know that this is the case? The relationships and bonds that form from these events are proof of that. If I was just some guy who showed up and talked at you for 10 minutes and then left, well I probably wouldn’t be invited back. Regardless of your background and experiences, they are both yours and nobody else’s. Nobody else has lived your life, nobody else has the same gone down the exact same path as you. Leverage those things – they are what make you unique. As for the Imposter Syndrome, accept that you may not know everything like some of the gurus (e.g. running a 10,000 host vSphere implementation), but you might have knowledge that they don’t (e.g. running a high-available vSphere environment for an SMB with 5 locations and high-latency WAN links). If you know who you are, and you don’t try and hide it, then you have beaten Imposter Syndrome. Great article Matt!! I totally agree! !